Chocolate chip cookie dough. Is there anything better? How many times have you eaten raw cookie dough before placing them in the oven to bake? Jason seems to think I only make chocolate chip cookies so that I can eat half the batch raw. And each time I do so, he restates the risks of eating those raw eggs in every delicious bite. Now my husband no longer needs to worry. I’ve come up with an egg-less and non-bake Cookie Dough Truffle recipe that curbs my craving for that raw dough. If you’re a fan like me, try this simple recipe. It literally takes 5 minutes to make and you can keep them in your freezer for easy access whenever you need to beat that craving. In a food processor, blend the almonds, walnuts, oats, cinnamon and salt to the consistency of dry sand. Add the agave nectar and vanilla and pulse to combine until a dough forms. Gently fold in chocolate chips. Scoop sections of the dough with a small cookie scoop or melon baller. 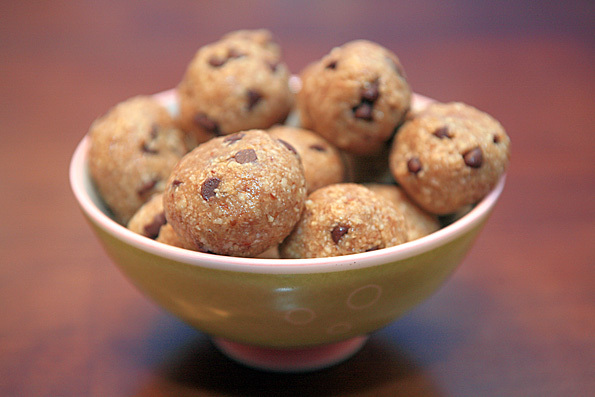 Place the cookie dough into the center of your palms, rolling them into the shape of a ball. You might want to wet your hands and the scooper because the dough will be very sticky. Place them on a cookie pan lined with parchment paper. Place the pan in the freezer for about an hour to firm up. Store balls in a tightly covered container in the freezer.